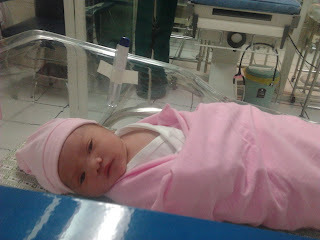 Two weeks ago, I gave birth to my little Angel named Rieka Shaine Tamayosa also known as Baby Aika. After the delivery I got very busy taking care of her, trying hard to breastfeed her and all the adjustments in my sleeping and waking schedule. Motherhood is truly a wonderful sacrifice I’ve ever had. When OB talked to hubby, she said she had a hard time because my baby’s arm was wrapped around her shoulder causing it to move the cervix with her every time I push. The arm goes out with the head that’s why she needed to push back the cervix. It was ouchy but good thing I’m a good girl and I’m a good pusherJ. Also, the baby is just too big for me (6.8lbs, because I’m small) and I lost many blood just like having a c-section. But I’m glad I made it through NSD. And of course my OB was so cool and very good. 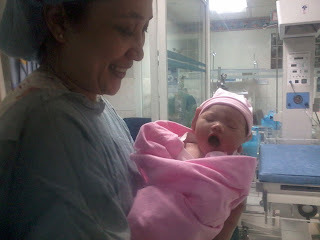 Good job for both of us, and the nurses as well! It was indeed a miracle. I still can’t believe I gave life to that little angel. I salute all the mothers because of the sacrifices and hardships of being pregnant, giving birth and raising a child. It was one thing I am so proud of and for me being a mom is a great achievement. My mommy career is making me so busy. Thanks for reading.